For the racehorse, see Ribchester (horse). The village has a long history with evidence of Bronze Age beginnings. It is well known as a significant Roman site being the location of a Roman cavalry fort called Bremetennacum, some parts of which have been exposed by excavation. In common with many towns and villages in East Lancashire its later history was dominated by cotton weaving; firstly in the form of hand-loom weaving and later in two mills. Neither mill still operates and the village is primarily a dormitory village for commuters to the town of Blackburn and the cities of Preston and Manchester. The main access road into Ribchester is the B6245. From the north-west, this is Preston Road, which merges into Church Street. From the east, it is Blackburn Road, which, at its westernmost extremity, also links up with Church Street, albeit closer to the centre of the village. Stonygate Lane, which runs to the north, partially follows the route of the old Roman road into Ribchester. The village was originally established as a Roman auxiliary fort named Bremetennacum or Bremetennacum Veteranorum. The first fort was built in timber in AD 72/73 by the 20th legion. The fort was renovated in the late 1st century AD and was rebuilt in stone in the early 2nd century. During the life of the fort, a village grew up around it. A fort remained at Ribchester until the 4th century AD and its remains can still be seen around the present village. Little is known about post Roman Ribchester although the presence of St. Wilfrid's Church indicates that it retained some significance. When Henry VIII's antiquary visited Ribchester in the 1540s he described it thus: "Ribchestre ... hath been an auncient towne. Great squarid stones, voultes and antique coynes be found there". When, a short while later, William Camden, author of Britannia (1586), visited the village, he recorded the saying that starts this section. That the site of the Roman fort remained the focus of the village is indicated by the later building of St. Wilfrid's Church very nearly over the Principia or headquarters area of the Roman camp. The church's website provides a detailed history of both St. Wilfrid's and St Saviour's Church, which stands in the nearby settlement of Stydd and which is perhaps a remnant of a Knights Templar or Knights Hospitallers establishment. In the 17th and 18th centuries the village became, like many in East Lancashire, a centre for cotton weaving. Initially in the homes of the weavers and latterly in two mills (Bee Mill and Corporation Mill) built on Preston Road on the northern edge of the village. In 1838 William Howitt published his Rural Life of England, in which he described conditions in the weaving districts of East Lancashire. "Everywhere extend wild, naked hills, in many places totally un-reclaimed, in others enclosed, but exhibiting all the signs of neglected spiritless husbandry ... Over these naked and desolate hills are scattered to their very tops, in all directions, the habitations of a swarming population of weavers ... In Ribchester our chaise was pursued by swarms of [these] wooden-shod lads like swarms of flies and were only beaten off for a moment to close in upon you again, and their sisters showed equally the extravagance of rudeness in which they were suffered to grow up, by running out of the houses as we passed and poking mops and brushes at the horses heads. No one attempted to restrain or rebuke them; yet no one of the adult population offered you the least insult; and if you asked the way, gave you the most ready directions, and if you went into their houses, treated you with perfect civility and showed an affection for these little brats that was honourable to their hearts and wanted only directing by a better intelligence. The uncouthness of these poor people is not that of evil disposition, but of pressing poverty and continued neglect". The weaving of cotton and other textiles continued in Ribchester until the 1980s, when the last weaving business closed in Bee Mill. The parish was part of Preston Rural District throughout its existence from 1894 to 1974. 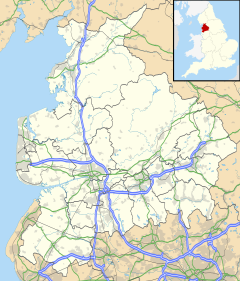 In 1974 the parish became part of Ribble Valley. The village is situated at the foot of Longridge Fell and on the banks of the River Ribble. The solid geography is of thick boulder clay deposits from the River Ribble over Sabden Shale. The area around the village shows signs of the river having moved with obvious terracing caused by the meanders. The River Ribble is prone to extreme spates and this often leads to flooding in Ribchester during the winter months. Ribchester stretch of the River Ribble. River Ribble in full spate. In 2000 the Ribchester Millennium Projects Committee marked the millennium with the publication of a book entitled Ribchester: A Millennium Record. Its main aim was to record events during 2000 but as an adjunct to that it carried out a statistical survey of the village. The survey, which was conducted in January 2000, collected data from 500 households in the parish of Ribchester and produced data relating to 1,244 people. The following demographic data is drawn from this survey. The population taken at the 2011 Census had increased to 1,598. The two mills that were the mainstay of the village in the early part of the 20th century are closed. One, Corporation Mill, was demolished in the 1980s. The other, Bee Mill, is now home to a range of small businesses. There are three public houses in the village: the White Bull, the Black Bull and the Ribchester Arms, as well as a sports and social club that was the working men's club associated with the mills. There is a small Spar shop, which occupies the site once occupied by the Co-Operative store, and a tea room. St. Wilfrid's Church stands by the River Ribble on what was the centre of the Roman fort. It is believed to have been founded by St. Wilfrid in the 8th century. Although properly in the neighbouring settlement of Stydd, St. Peter and Paul's Church is an early barn church. Nearby are alms houses and the Church of St. Saviour. The inn, which dates back to 1707, is a Grade II listed building with some unique exterior features. It stands on Church Street, in the middle of the village, and is well known for its portico, which is said to be supported by two pillars taken from the Roman fort. Above the portico is a rustic wooden representation of a white bull. The inn was put up for sale, in January 2017, at an asking price in excess of £385,000. The pub was patronised by the members of Time Team during their three-day visit to the village in September 1993. The honorary curator of the village's Roman museum, Jim Ridge, for whom a gallery is named in his honour, was a former history teacher at Broughton and then Fulwood High Schools. The back garden of his home, at 2 Church Street, opposite the primary school, was excavated during the programme. Opposite the White Bull pub are a row of cottages noteworthy for their unusual configuration of windows. Built for the hand loom weavers they have three levels with a single window at the uppermost. Although it is commonly believed that the window in the top level is to illuminate the looms this may not be the case as the weaving would probably have been carried out in the lowest part of the house because of the size of the loom and the need for damp conditions to keep the cotton flexible. Adjoining the churchyard of St. Wilfrid's Church are the excavated remains of the granaries which belonged to the Roman fort. A short distance east of the village and behind the White Bull pub, are the remains of the Roman baths. Near to St. Wilfrid's Church is the Roman Museum which has recently been refurbished and remodelled. The museum houses many of the finds from the Roman fort. The most famous find, the Ribchester Helmet, is on show in replica, but the original is in the British Museum collection. Previous Census returns for Ribchester show that 86.7% of the population expressed themselves to be Christian with the majority of the remaining population professing no religion. In the 2011 Census 78% expressed themselves as Christian. Almost 22% were either no religion or religion not stated doubling the previous results. There are three places of worship in Ribchester. St. Wilfrid's (which incorporates St Saviour's, Stydd) is a Church of England church within the Diocese of Blackburn. St. Peter and St. Paul's Church in Stydd is a Catholic church coming under the Roman Catholic Diocese of Salford. There is also the Mission Church. On the third weekend of June each year the village celebrates its annual Field Day. Such an event is common to the villages in the area where they are variously known as Club Days or Gala Days. Field Day event marked its 50th anniversary in 2010. Each year the village organises a 'May Day Market' on the Spring Bank holiday which is the last Monday in May from 7.00am when most of the village clubs, churches and charitable organisations set up and manage stalls as a means of raising funds to support their activities through the year. The market takes place on the 'Bee Mill' site on Preston Road. Window of Ribchester Primary School. Looking down an alley connecting Church Street (foreground) and Water Street. Homes on the western side of Church Street. White Bull public house, one of three in the village. Palm Sunday parade moving from outside the White Bull pub to St. Wilfrid's Church. ^ "Civil Parish population 2011". Retrieved 22 January 2016. ^ Time Team episode "On the Edge of an Empire"
Wikimedia Commons has media related to Ribchester.